The Superheroes Tour in New York is highly recommended for all fans of Marvel and DC comics. During this three hour bus tour you pass over 40 locations that you’ll recognise from your favourite films and series. See, for example buildings from Spider-Man, The Avengers, Iron Fist and The Dark Knight Rises. The guide gives you all the in’s and out’s of the locations as you pass. While, on the screens in the bus, you watch clips that were filmed in these places. 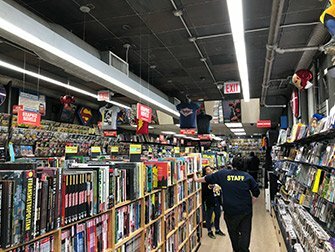 The Superheroes Tour in New York begins at a comic book store in Midtown Manhattan. Here, you’ll meet your guide, who, most of the time is dressed in the style of the tour (my guide wore a Superman cape and carried the hammer of Thor). Make sure that you arrive within plenty of time so you can take a look around the store. 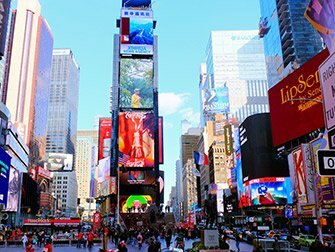 Then you board the bus and the adventure begins right away, on Times Square. Here you will see, amongst other things, the place where Spider-Man fought Electro and saved Mary Jane Watson. 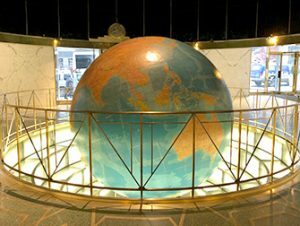 The bus then takes you via the Public Library and Grand Central Terminal to the first stop: The Daily News Building. You will probably recognise this building as the Daily Planet from Superman: The Movie. From here, you’ll also see the Chrysler Building, where the Silver Surfer escaped in Fantastic Four: Rise of the Silver Surfer. The bus continues on to Park Avenue, where The Battle of New York took place in The Avengers. 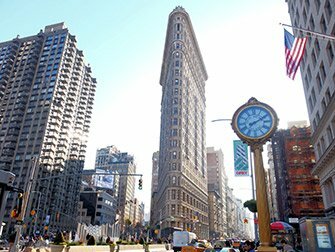 The next stop is at the Flatiron Building, this remarkable building was used in Spider-Man as the Daily Bugle headquarters. 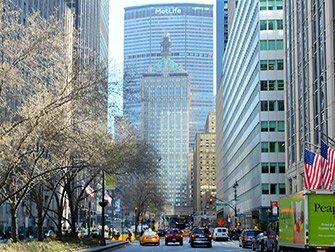 Via the Lower East Side and Chinatown, where Danny Rand fought for his life in Iron Fist, you head on to the Financial District. Here you will pass various places, including the location of the last fight between Batman and Bane in The Dark Knight Rises. The tour comes to an end in Battery Park, where you can take photos of the Statue of Liberty (as seen in X-Men and Superman: The Movie). A little further along, you can step aboard the free Staten Island Ferry, that Spider-Man tried to hold together in Spider-Man: Homecoming. Eric’s Tip: Do you want something to eat or drink during this tour? Then it is best to bring something with you. There are multiple stops along the way but the guide tells you interesting facts about the places that you see, so it would be a shame to miss anything. After purchase, you will receive a voucher per e-mail, you can print it out and use it as your ticket for the tour, or show it on your telephone as a mobile ticket.